At Hotel Corona Rodier everything has been designed with your comfort in mind. 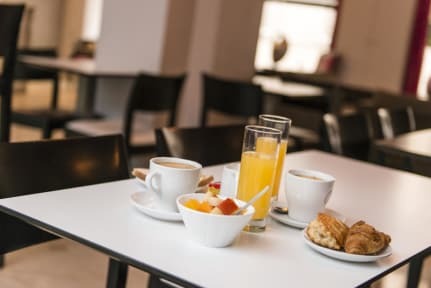 Our hotel is equipped with a lift, air-conditioning, and we provide free and unlimited Wi-Fi, free luggage storage, baby cots and a gourmet area with drinks and snacks. We can also place an iron at your disposal. You can enjoy a continental breakfast (gluten free and lactose free on request). Our friendly and welcoming team makes every effort to ensure that you feel at home at the Corona Rodier, with its spacious, airy and fully-appointed rooms (flat screen TV, mini bar, hairdryer, safe, etc.). 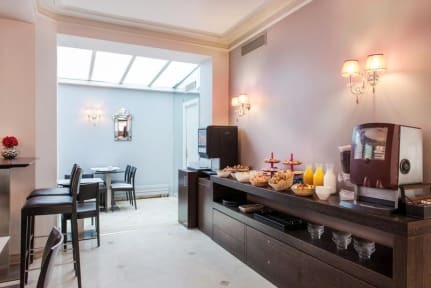 The hotel is ideally located in the heart of the 9th arrondissement of Paris. This district is ideal for visitors wishing to stay in Paris, whether they are here for business, visit, shopping or simply to discover the delights of Parisian life. The 9th arrondissement is a popular business district, the headquarters of major banks and insurance companies as well as training centres. This district is idea both for shopping or visiting. You will find the Basilica of the Sacré-Coeur, Moulin Rouge, Montmartre, the Museum of Eroticism, Galeries Lafayette, Opera Garnier and more! If you want to visit the Louvre or the Arc de Triomphe, these iconic landmarks are only a few bus stops or metro stations away. If you want to take a stroll or discover the atmosphere of Parisian nights, do not miss the rue des Martyrs, close to rue Rodier. Rooms on the fourth floor have balconies with panoramic view, and views over the Paris‘s rooftops on the 5th floor. Our exceptional rooms offer all the comforts, they are designed to meet your needs. Rooms are equipped with a flat screen TV offering French and international channels, a mini bar, a free safe and a private bathroom with WC and, depending on the room, either a shower or a bath. A hairdryer and a heated towel rail are also at your disposal. Please note that the Deluxe rooms have a smartphone docking station. Check in from 14:00 to 00:00. Check out from 06:00 to 12:00. Cancellation policy: 48h before arrival. Payment upon arrival by cash, credit cards, debit cards. This property might pre-authorize your credit card. Breakfast not included - 13 EUR per person per day. We stayed in room number 42, it was a nightmare. This room had a leak and the smell was unbearable, the floor was wet and dump that you could walk barefoot. It smelled like humidity and we had to sleep with the window open even knowing that to buildings far away it was a bar that opens until late night. The whole stay was very uncomfortable and unhealthy. We request to move to a different room but they denied our petition. I don’t think they offer a fair and safe service at all.